Following the introduction of the patented Super Diffuser (SD) to its entire impact plastic sprinkler range in 2013, NaanDanJain releases this year 2 new innovative products resulting from years of R&D and holding exclusive patents, the Smart Jets and the MagicDrive. This season we continued to see the introduction and development of many new products from our international suppliers. The rate and speed of R&D development and market availability seems to increase and the ability for Deeco to train in these new product features, gain supply and make them available to our customers is an increasing challenge we must all meet in this world of rapid technological expansion. Both these products will be available from Deeco Services in the coming weeks. The only static jet in the market that has all options of pressure compensation and insect proof with a variety of patterns: Smart Jet, Smart Jet IP (Inspect Proof), Smart Jet PC and Smart Jet PC IP. Full and wide range of options makes it easy and economical to match any application. Smart Cap to limit wetted area for irrigating young trees. All models use the same frame for each unique jet pattern. Exclusive approach of insect Proof based on extended nozzles. Insect Proof model reduces plugging and amount of labor needed to check plugging. 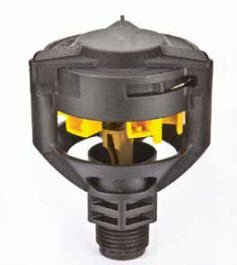 Troublesome spider maintenance of sprinkler and jets avoided. PC model maintains flow and enables using longer laterals. Large variety of nozzles & jet patterns. With different jet patterns, Smart Jet family can match any tree spacing. Adaptors are available for matching Smart Jet to NDJ spikes (31, 36 & 37) and 5.8mm rod. For young trees Smart Cap to limit wetted area. To be removed for larger wetted area (mature trees).